3D Systems has today unveiled a new environmentally friendly 3D printer called the Ekocycle Cube which has been designed by 3D Systems to use recycled materials as the filament to create 3D printed objects. The new Ekocycle Cube 3D printer has been designed and built from a collaboration between 3DS and Ekocycle and has this week been launched by will.i.am and The Coca-Cola Company. 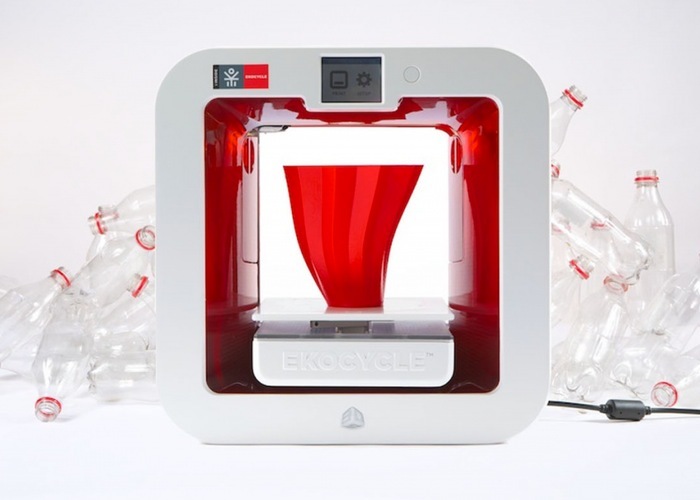 The Ekocycle Cube 3D printer allows users to repurposed something old for something new and encourages a change to the way we think about recycling. Watch the video below to learn more about this unique 3D printer project. The Ekocycle Cube 3D printerIs priced at $1,199 and has been designed as a plug and play consumer 3D printer for the home or school and shipments are expected to start within the second half of this year. Features of the new Ekocycle Cube 3D printer include a 70 micron high resolution print head and a print area of up to 6 inches cubed in size. Together with ultra-fine supports for complex prints and a choice of either auto settings or advanced settings depending on your 3D printing skills and requirements. For more information on the new Ekocycle Cube 3D printer jump over to the 3D Systems website and press release for details and to signup for updates.